Take advantage of a risk-free service in Brompton that has gained over 95% of positive client feedback! Q: What does the window cleaning in Brompton involve? A: Our service will be conducted by skilled and background-checked Brompton window cleaners. They'll also don branded uniforms, so you'll easily identify them as soon as they appear near your premises. A: Essentially, this is an extendible rod that shoots water under powerful water pressure. It allows the technicians to reach the fourth floor of any commercial or residential building without having to climb the rooftop. A: Not at all! The experts will make use of a special purified water tank inside their van. However, if the tank is empty, we will happily take your offer. A: You must make sure that there will be a unoccupied parking slot within 30 metres from your premises and on the same side of your panes. The professionals also need to have an effortless access to your property. With window cleaning in Brompton, you'll give your glass surfaces the expert clean they deserve... at custom-tailored price rates that will stay within your budget! Don't believe us? Scatter your doubts by checking our price table below. With window cleaning in Brompton, we can improve the appeal of your building even if it scrapes the clouds above. Let's review what you'll get once you go for our custom-tailored service. For exterior window cleaning, the Brompton window cleaners will make use of a telescopic water-fed pole. A water pump inside the team's van will send filtered water up the hose and out of a brush-head attachment. The water, together with the brush-head, will erase any traces of mud from the casements of any four-storey premises. With rope access window washing, the specialists will use safe abseiling gear to reach even the uppermost storeys in your industrial or home property. We have all necessary COSHH documentation and risk appraisal reports and can send them to you as soon as you need them. Moreover, we frequently check the washing gear to ensure that your appointment will go according to plan. And to wipe every inside corner of your window façade, the proven team will use the classic squeegee and ladder cleaning procedure. 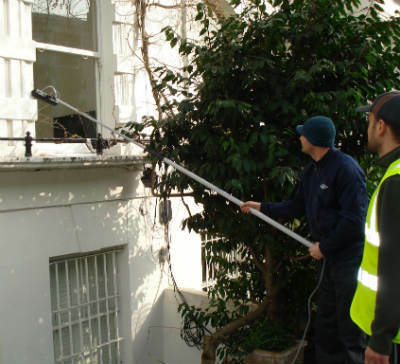 As we obtained more and more positive responses from our clients, the request for window cleaning in Brompton has noticeably skyrocketed in close by areas. You can go over the locations we've covered in the list below. Another quick and easy way to get a free instant quote or to book window cleaning services Brompton SW1X is through our web site.